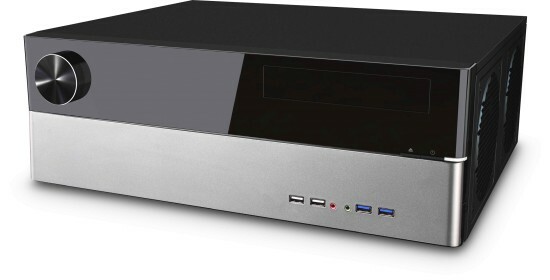 Powered by Jonsbo, the G3 is a great looking low cost HTPC chassis that utilises standard PC components. The G3 is a fully featured HTPC enclosure with a depth of 351 mm. It is approximately the size of a typical receiver and fits perfectly into any hi-fi environment. The front has a mirrored acrylic surface and a big volume knob that gives the case a particularly refined appearance. Two USB3.0, Two USB2.0 and the audio ports can be found at the front along with the power button which is also built into the front of the chassis. There is a special optical display, which says "Home Theatre PC by Jonsbo". This is not programmable but can be turned off if not required. With focus on the use in the home entertainment area, the case offers a single drive bay for a 5.25" optical drives. It uses a flip-down bezel for the CD-ROM-/DVD-/BluRay-drive, therefore it is discreetly integrated into the uniform design so the overall visual impression is maintained even when using different coloured optical drives. The case is manufactured using 0.8mm SECC steel that provides high level of stability. A strut that connects the front of the chassis to the back improves the stability even further. This makes it possible to (carefully!) install more hi-fi units on top of the G3 without risking damage to the top cover. The interior space of the G3 is completely black. 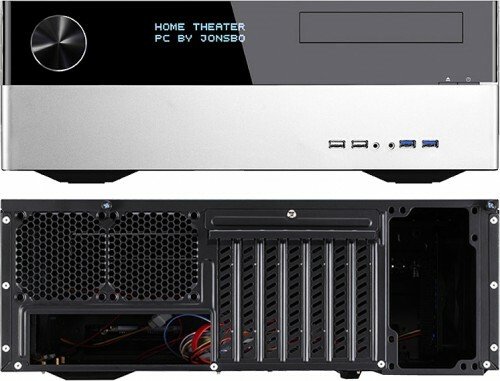 Despite its compact dimensions, an ATX motherboard and ATX power supply can be installed. It is therefore perfectly suited to be used as a base for a living room system with full-size graphic cards and high-performance components which are all compatible. 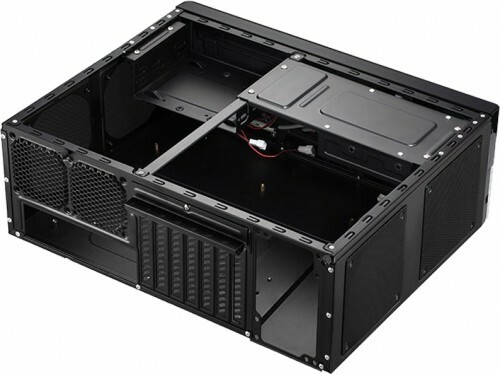 It even features seven PCI expansion slots which are located at the rear of the case. Up to three hard disk drives will fit in the G3 – either 3 x 3.5" or 2 x 3.5" and 1 x 2.5" HDD/SSDs. One of the hard drives will be installed below the optical drive, the other two in a separate hard drive cage, which is also located behind the front. For optimum cooling of the installed hardware, up to three 120mm fans can be installed on the sides of the case which feature dust filters. One 120mm fan is supplied with the chassis. At the rear of the case, above the I/O shield two 80mm fans can be installed. The area for the power supplies intake fan is covered by a dust filter and thus prevents dust particles from being sucked into the power supply. These cases are supplied with the backlit version of the display. There is no Reset connector. There is no Fan Speed Switch as indicated in figure 4. The remote control receiver is not supplied. - Power button and DVD eject button are almost one button. Too easy to switch the PC off when you try to press the eject button. - DVD drive gets in the way of installing a tall processor cooling fan / heatsink.